Stories and Essays. Edited by Christopher Rea. NY: Columbia University Press, 2011. 272 pp. 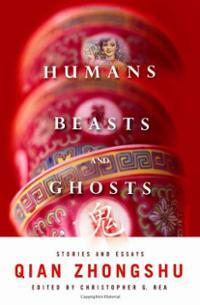 Humans, Beasts, and Ghosts consists of the writings by Qian Zhongshu originally published in two separate books, a volume of essays entitled Written in the Margins of Life (写在人生边上, 1941) and one of short stories entitled Human, Beast, and Ghost (人兽鬼, 1946). Both books are rather small, the first consisting of ten essays; the second only four stories. The current English translations were based on the 1983 edition of the two books, which were published together as a single volume and must have originated from the same intention as that of Christopher Rea about this English edition: “to offer readers a more comprehensive picture of Qian’s early works” (vii). But browsing through this “comprehensive” picture makes one realize that “comprehensive” is, ironically, about the least adequate description for these essays and stories. On the contrary, it is the acceptance of one’s limitation, to echo the title of Qian’s book of literary criticism Limited Views (管椎编), that would be closer to the author’s own perception of these works. Indeed, Qian’s self-knowledge of being “limited” defines the aesthetic stance toward life and art propounded in the essays in Written in the Margins of Life. As Qian explains in his preface to the 1941 edition, these essays are but “piecemeal, spontaneous impressions [that] do not constitute their verdict on the entire book [of life]” (32). They “may contradict one another or go overboard” (32). The author himself is limited. He is not a professional “book critic, who shoulders the weighty tasks of guiding the reader and chiding the author,” but a “spare-time diversion seeker” who “brows[es] at [his] own leisurely pace”(32). These phrases should be taken not as a conventional self-disclaimer, but as candid self-revelation that gives hints about the intellectual frame of mind that finds its expression in the ensuing pages. Upon closer examination, Qian’s essays illustrate a dialectical engagement between the self-knowledge of being “limited” and the yearning for a more “comprehensive” or rounded understanding of life and art. On the one hand, Qian endorses prejudice, for prejudice implies nothing but a focused or “stimulated” perception on things (“Prejudice”): “What we commonly refer to as prejudice is best likened to using one eye to take aim at a target” (62). Depicting human understanding with a series of aural metaphors, Qian suggests that prejudice operates like a super-sensitive amplifier that tunes out the chatter of the world, “the so-called ‘piping’ of Man” (人籁), and broadcasts with loudness and clarity the “piping of Heaven” (天籁). The sound of nature is instrumental for the human mind to operate, for it allows it to attain the optimal state of enlightenment described in terms of “transparency” (空明) and “quietude” (寂静) (64). Prejudice is thus not antithetical to enlightenment, but constitutive of it. Using a language that conjoins Daoist epistemology with a poststructuralist penchant, Qian hereby issues a powerful defense of prejudice that melds together Eastern and Western philosophical traditions. On the other hand, Qian’s defense of prejudice does not translate into a defense of solipsism or tunnel vision. Rather, his essays are nothing short of an objective lesson of a “comprehensive” mind reflected in both content and style. The rich and myriad allusions in his essays serve to connect various “limited views,” different conceptual and aesthetic categories both Eastern and Western, often in a surprising yet brilliant manner. Qian’s knack for allusions, as Rea argues in his introduction, is more than simply showing off his erudition. It connotes, rather, a form of “intellectual egalitarianism” and exemplifies the working of a cosmopolitan mind. Still, even as Qian’s cosmopolitanism is premised upon a conceptual equality among world cultures, this worldliness can also be daunting simply because the knowledge-scape it commands is too vast for any scholar with “limited views” to grasp. To be honest, I have always found the Chinese essays to be dense (in some cases, such as “On Writers,” “Explaining Literary Blindness” and “On Moral Instruction,” more than the others) due not just to the compactness of allusion, but to the quick switching between vernacular and classical syntax. In one “On Laughter,” Qian makes a dig at Lin Yutang and the vogue of “humor literature,” arguing that “humor cannot be promoted” because the “moment it is promoted, the natural turns into affect, the mercurial turns into rigidity” (48). But one wonders if Qian’s overpowering prose style, peppered with many foreign names and classical titles, would also run the risk of artificiality and “rigidity.” Partly because Qian has borne a reputation as “the leading man of letters” since the late 1970s, we tend to think of his prose as a model of the contemporary essay in vernacular Chinese. In fact, his style manifests a kind of experimental anachronism that is itself a cultural gesture not uncommon among essayists of the 1930s and 1940s, such as Lin Yutang. Both Qian’s “limited views” and “comprehensiveness” call for an appropriate understanding within a specific historical context. Granted that Qian’s essays often carry more depth or intellectual rigor than those of Lin Yutang, but this advantage may not fully compensate for the labor that goes into reading them. In more than one way, Rea and the other translators have done a great service by making Qian’s prose more accessible and his thought process more clearly punctuated at every twist and turn. I sometimes wish that there had been either more or less intellectualism in these essays. In “Prejudice,” for instance, I detect the problem of short-circuiting an intellectual argument by smoothing it over with rhetorical flare. Toward the end of the essay, Qian endorses Schopenhauer’s adage that “a thinker should be deaf,” but it remains unclear to me how by tuning out the “cacophony of human voices,” one can still approach one’s own “voice” and perception with relativism. How can the deaf thinker be aware that he is “too . . . a noise-making animal, that . . . [has] stomped on the heads of people living downstairs”? (65). Self-reflection, or the awareness of the philosopher’s own embeddedness in the world of noise and voices, is an argument insufficiently attended to by this essay. On a larger scale, this flaw can perhaps be taken as a manifestation of the “prejudice” of Qian’s cosmopolitan mind or the particular brand of comparative practice championed by this mind. Yes, Qian’s juxtaposition of the East and the West, the modern and the traditional, may “open up an arena of contesting ideas without presupposing the superiority of one over another on account of their origins” (Rea, 5). But might it be possible that the distinctions not so much among individual ideas but between paradigms of thought are not sufficiently noted in Qian’s use of allusions and comparative practice as a whole? It would be impossible to reach a definitive answer to this question without a thorough revisiting of Limited Views. For the present, I am more inclined to think that the flaw may be partially caused by the quickness of the eloquent ending that is appropriate for a Chinese “familiar essay” or 小品文, but less so for a scholarly treatise. Allowing the reader to read the essays along the side with the short stories is perhaps the most helpful measure the editor has provided toward a better and fuller appreciation of Qian Zhongshu. There is a certain kind of intertextuality between the essays and the short stories, which is fascinating to observe. The stories carve out an imaginative space where the intellectual mind of the essays shows its more humane and humanistic sides. For instance, in “Explaining Literary Blindness,” Qian writes that “the difference between civilized humans and savage beasts is that humans possess a transsubjective point of view” (69). He further defines this “transsubjective point of view” as an analytical frame of mind that allows humans to “divorce questions of right and wrong . . . from . . . personal gains and loss,” or “separate questions of good and evil . . . from . . . individual likes and dislikes” (69). The short story “Souvenir” can be considered as an exercise in “transsubjectivism” understood not as an intellectual ability to abstract, generalize, or moralize, but as an empathic capability that resorts to feeling, not reason, to relate to other human beings. “Souvenir” depicts the loss of Manqian both in her marriage with Caishu and in her extra-marital affair with Tianjian, a cousin of her husband. “Transsubjectivism” here manifests itself as a long-distance view of all three characters that allows the author to lose sight of neither the “questions of right and wrong” nor “individual likes and dislikes”–in other words, matters big or small. The characters are slaves of the heart and puppets of reason. Yet, in approaching their blindness from afar, the narratorial voice conveys nothing but empathy toward their transgression and weakness and demonstrates an affective understanding that endows the characters with life even as they themselves have emotionally died, as conveyed by this description of Manqian: “It was as if Manqian’s body had been contaminated by death, as if a part of her body had been snatched away by Tianjian and had died also” (202). Trans-bodily transsubjectivism leads to a subject position that is not the same as the sharp-tongued critical voice of Qian’s essays, but it is not totally unrelated to this voice, either. The difference in tone and perspective between the essays and the short stories, I would surmise, comes from a different management of vulnerability of the author himself and the characters. The fictional world created by Qian is populated by characters whose intellectual penchant only leaves them displaced and helpless (here I am thinking about Fortress Beseiged 围城) Yet in his essays, Qian would never consent to a rhetorical position of vulnerability, for doing so would risk compromising the strength of his argument. In this respect, while I agree with Rea that we should not “critique Qian by the standards of present-day morality” (16), we can, however, take note of the intertextual connections and contradictions between the essays and the stories, so as to get a better view of the different gears in which this empathetic yet occasionally mischievous mind operates. A final question that remains to be answered if we want to “reappraise” Qian Zhongshu, as Rea advocates in the introduction, is the institutional structures (readership, media, and comparative literature as a historically evolving institution) that shape both the tone of his essays and the intellectual practice in his critical works. Intellectuals in Qian Zhongshu’s times did not need to be as aware of their straddling over different worlds of literary criticism, literary practice, journalism, or public culture as we do today. The world of belles lettres back then was simply not as divided or professionalized as now. Considering this difference, is it possible or worth the effort for contemporary writers and scholars to emulate Qian’s “comprehensiveness”? Or is it useful more as a footnote to intellectual history? These questions ultimately will determine how much weight the essays and short stories carry in Qian’s oeuvre and in what ways these texts will enter into our curriculum.